"Kirk to Deep Space 9: Beam me up"
Let's cut to the chase because I don't have a lot of time these days and I'm sure you don't either. Who says that wintertime is a lot of sitting around indoors doing nothing? They're wrong. I looked at the cards that I'm showing you today and I started to get a little hope again for DS9 decks. They've had some serious false alarms in the last couple of sets. The sieged DS9 team have a good idea but they suffer from the realities of math where probability of any card early limits reliability from round to round. Then there's Holding Cell. A card that should act as a bullet against popular strategies utilizing power personnel that are giving your opponent an advantage plus the interrupts they might be using to cheat past dilemmas. The problem with Holding Cell is that it costs four for a headquarters whose best people also cost four and so taking away one person doesn't help when the opponent is just speeding past you the old fashioned way - with bargain-priced personnel. So it's time to call in some help for them. Let's start with the hot new tech. It comes in the form of Promenade School. As you already know, the theme of this set is five points - both gaining them and using them. This card is the former. It's a simple proposition, stop four DS9-icon Federation personnel of four different species to score five points. Celebrate the diversity that is the Federation, especially as it is by necessity on Deep Space Nine. It shouldn't be terribly hard. There are lots of different personnel that you can play with to accomplish this modest task. Start with a human, and from there you can choose from a Starfleet Emissary Bajoran, a Benzite, a Federation agent Cardassian, an independent Elaysian, a young Ferengi, a Klingon, a Tiburonian, and several Trill options. In total, you have nine species to choose from. In a small(ish) deck coming up with four shouldn't be hard around turn five. Utilize Bustling with Activity (if the deck is DS9 and not DS9 Earth) and you can chain download and roll it on turn three. The point is, though, now you have your gas; let's find out who's the first man driving the car. The guy driving this new car is Charles Whatley. He falls into the category of what to use with the five points Promenade School has given you. With him, he's bringing James T. Kirk (Original Thinker) and Spock (Trainee Instructor)...or James T. Kirk and Sirna Kolrami...or James T. Kirk and Data (Commanding Officer)...or James T. Kirk and Hikaru Sulu (Loyal Captain)...or a combination of any two of them. Lots of options since chances are you want to have at least three of them so that there are at least two in the deck when you actually perform the the download. I think we can all agree that having one of the Kirks riding shotgun in your car is always better than not. Next to come help is Jaresh-Inyo who finally makes a Second Edition appearance. He chooses to go the somewhat opposite route and have Earth call DS9 for some help. 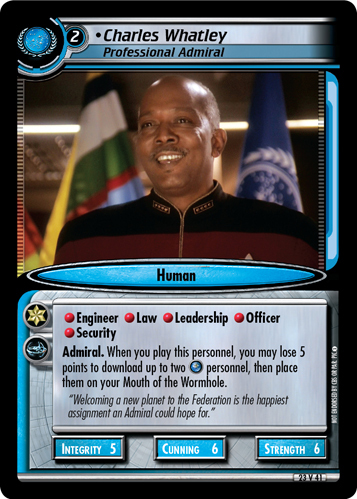 When you play him, he can bring in around twelve counters' worth of DS9 personnel for the low cost of five points. You could choose a Benjamin Sisko, a Dax, a Worf, a Julian Bashir, or a William Ross. If you choose to play dual headquarters and bring in DS9 Bajorans...which if you do, could be 15 counters' worth of people in Emissary Sisko, Odo and Kira! That's equal to two At What Cost? boosts! Granted, it's still not as user friendly as a weenie Cadet deck since the cost of the personnel is much more steep, should you have to pay full price from hand. That being said, I'll still take it since if you do play dual headquarters you can play with both Jaresh and Charles with all their download targets and not worry about dead cards cluttering your hand. The last person to come help you is *yawn* Luther Sloan. All he does is use your cheap events to destroy your opponents' events...*yawn*... nothing special there. Before you get too excited though, I checked with our Second Edition Rules Liaison and it appears that he does not work with a couple of conveniently cheap events that would work perfectly with him. So before you start worrying about this, I'll make it clear. That doesn't work. Okay, everyone let's move along...nothing else to see here. 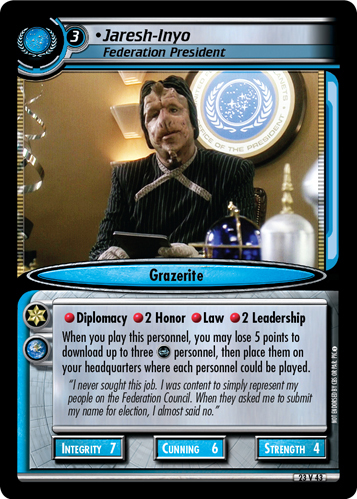 What he does do for you, though, is provide a single headquarters means for DS9 to finally wreck events instead of having to work with Ferenginar, Earth, or Bajor. There are plenty of other cheap events that DS9 can use with him instead. Such as one that goes after dilemma piles and another that protects your events. As a bonus, Luther also works well with Federation Garak. Tag team lying - sweet.